Represents great value and these always sell out FAST! 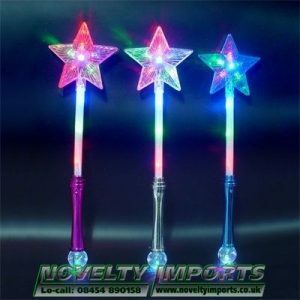 24 mixed light up flashing led items, which can include swords,spinners,headbands,bubble wands,bubble guns,fibre optics,wands,sticks etc as seen in the picture. 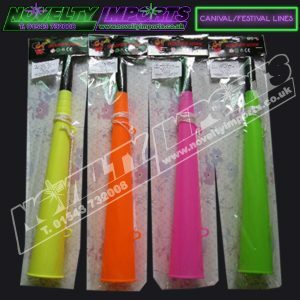 Ideal if you want a small assortment of light up novelties. Made up of samples, end of line,clearance and re-packaged items all come complete with batteries. NO RETURNS ACCEPTED ON SALE/CLEARANCE ITEMS. ** End Of Line Clearance Sale ONLY 90p each **. A crystal type Christmas tree lights up with hyper bright red/green/blue led’s in the tree part and also the projection ball giving an amazing array of patterns and effects. 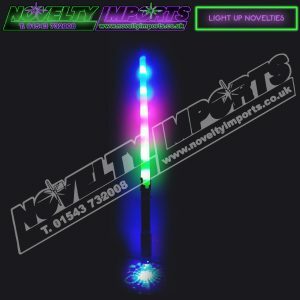 Now in stunning chrome effect pink & blue handles Just over 13″ (inches approx) in size has 3 functions and comes complete with 4 x AG13 replaceable cell batteries. 1/pc bag packing and 24/pc inner carton and 144/pc to this full carton. NO RETURNS ACCEPTED ON END OF LINE CLEARANCE SALE ITEMS. ** END OF LINE CLEARANCE SALE ** Great for Halloween or spooktacular events. A HUGE 18″ (inches approx) in size at an amazingly low price! Will make a superb prize every time win or tombola stall prize. 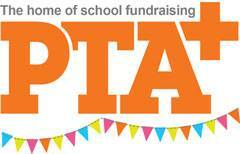 Ideal for charity school and charity events. These look so impressive for the money! LTD Stock 30/pc bag made up of mixed designs and colours. NO RETURNS ACCEPTED ON CLEARANCE SALE ITEMS. Clearance Sale ON SALE AT MUCH LESS THAN COST!!! 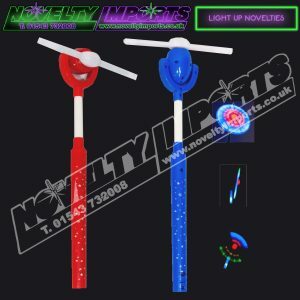 ONLY 50p Don’t confuse these with cheaper versions, our LED Finger Fidget Spinner has 3 selectable red/green/blue flashing patterns. LED’s can be turned off by a switch and are not motion sensors unlike the cheap versions you throw away, you can also change the batteries on ours. CE Tested and fully labeled 1/pc display box 100/pc to this carton. Random mixed shell colours of red/blue/white/black. NO RETURNS ON SALE CLEARANCE ITEMS. ** END OF LINE CLEARANCE SALE ONLY £1 ** This item is so HOT the biggest craze of 2018? Kids and adults alike will be amazed at this flowwing metal spring, great stress relief and very hard to put down. GET THEM FAST…. 24/pc inner and 72/pc full carton. NO RETURNS ACCEPTED ON CLEARANCE SALE ITEMS. ** ON CLEARANCE SALE AND ONLY 65P EACH ** Get them while they are HOT! A good mixed selection ranging in size from 5-11cm in counter top display box and individual plastic boxes some on key chains. Suitable for ages 8+ they are a massive line. We have LTD stock on these and will sell out fast! 12/pc counter display box and 144/pc to this carton. NO RETURNS ON CLEARANCE SALE ITEMS. Dated 2017 but tested and working well. These AA Eco friendly Green Max batteries are ideal spares/replacements for our light up toys. On clearance because of the date at only 5p each! BARGAIN. Be quick TLD Stock. 48 x 10/pc card total 480 AA batteries. NO RETURNS ON CLEARANCE GOODS. End Of Line Clearance SALE PRICE….. Only 10 cartons available. The BIG (approx 45cm in height) Come On England St George foam spectator style foam hands, fantastic for many England sports and gaming spectator events. 10/pc bag of white foam with red print. 100/pc to this full carton. No returns accepted on clearance items. A chance to cheer England on to the MAX at sporting events or show you are proud at Royal events at St George day festivals. Quality loud cheer spectator woofer horn with St George flag attached. 1/pc Single horn packed in England bag packing 120/pc to this inner carton.